I have an anxiety disorder. There it is, I said it. Phew! That wasn’t so hard I guess… but I’m someone who doesn’t openly discuss my anxiety issues, (being a bit of a proud and stubborn person), I still find it hard to admit that I have difficulties, which were on a daily basis. But here I am opening up about it and who better to share it with than you lovely mums? I came off Facebook earlier this year and I’ve not looked back. When I realised that it was causing problems for my mental health, I decided it was best for me to finally ditch it. Facebook has over the years been a great way for me, (like most people who use it), to stay in touch with old friends and new, but as my long-term relationship broke down, it was visually obvious just how much I had lost in the process. Seeing that old friends and family were deleting me out of their lives, after years together, took its toll on me and contributed towards my illness. Memories popping up each time I logged on. My anxiety was constantly telling me how lonely I had become. Some of my closest friends, I thought would be there through thick and thin, weren’t as supportive as I needed at that time, (and I recognise now that yes I was needy), and Facebook was reminding me of how much fun everyone was having, whilst I was falling into what I didn’t see at the time as depression. Of course when you’re in a better state of mind, you know that Facebook isn’t really ‘real life’, but as a result I was further pushing those people away and isolating myself as a way of coping, which I can see now. Facebook again continued to serve as a reminder that as I reached my 30s and had become a mum, that I was no longer such a socialite. I love being a mum, so I accept that I can’t do as much; it’s part and parcel of being able to have a wonderful child, but it doesn’t mean that I’ve stopped being me! Am I still fun to be around? My anxiety would chime in to torture and remind me that I’m lonely and instead of fun nights out, I’d be updating everyone on my excitement that I’d managed to get through the day without tearing my hair out. The final push for me as a mum with anxiety was because I was noticing that family members were using Facebook as a way to ‘stay in touch’ with my daughter, by picture comments. Whilst it’s lovely to hear from people and to get their well wishes, (I don’t want to seem ungrateful), it means nothing to a baby/toddler, when she’s older and can read it’s a different story. I felt like people were knowing what my daughter was up to, without really knowing her and my anxiety again was causing me to have difficulty processing and dealing with this. Relatives, living nearby, were often going long periods of time without seeing my daughter. I knew I would much rather be able to see those people in person to build up relationships the old fashioned way, no matter how often that was. Coming off Facebook felt like the push I needed to arrange to see people more in person. Coming off Facebook helped me to concentrate on my little circle of close friends and family and helped me to prioritise what is important to me and my family. 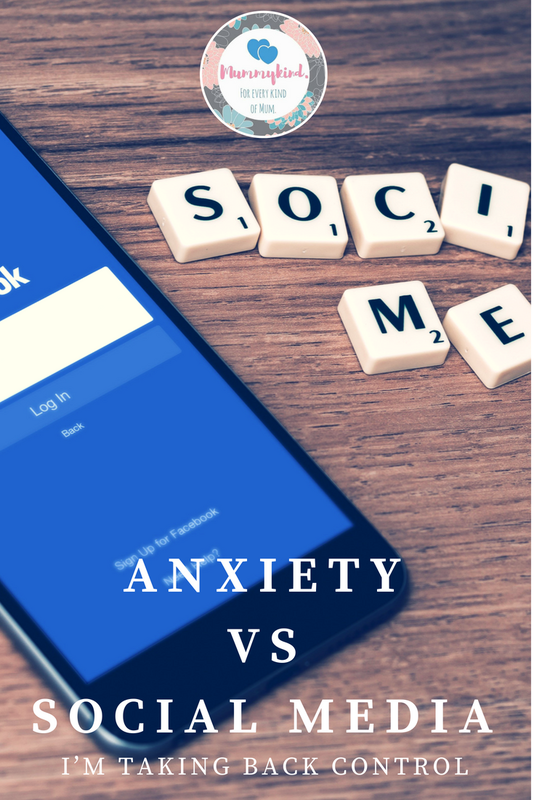 Leaving Facebook didn’t of course erase all of my mental health issues, but I’m using the social media that doesn’t trigger my anxieties instead which has helped me to feel more in control. Facebook is no longer there to remind me of the person I used to be; because I am finding that person again myself. Getting additional help from my GP has meant that my anxiety isn’t feeding me this false information, which sends me into a downward spiral where I am convinced that I am lonely. I am also far better at dealing with things that would have previously been a trigger. I’m in a place now where I can stand up to the anxiety, (which I refer to as the A hole), and I can say I have my daughter’s and my partner’s love and that is more than enough! So with my little social circle of mums and treasured old friends, I feel very rich indeed. I haven’t felt this good about myself in a long time and I have more confidence than ever before to get out and meet new people. Each day feels like a new exciting opportunity now. Thank you for reading about my journey. I agree! Facebook is helpful for finding out about what is going on for little ones and the buy and sell pages. I can understand your anxiety problem, cause I am also a female. I had also a problem with the same situation, was a miserable whole night. Someone told me about CBD products for anxiety and depression, and I purchased from an online website. Now I am feeling better, living better and sleeping better, So I think you should try it. Previous Post Clothing for Curvy Mummas – Where is hot and where is not!